Our big boy is 3 1/2 years old, about 45 pounds and 104+cm tall. Since he is now pulling himself to stand, he could not safely stay in his crib. Half way through dismantling his crib he started to get quite concerned. I asked daddy to take over so that I could hold Isaac and reassure him. I showed him his toddler bed and told him it was his new bed. I asked him where his bed was and he looked from one bed to the other and then pointed to his crib. Made me laugh. Isaac needs all of those to help him adjust. A little trick up my sleeve? Making sure that he’s tired each night and really ready to go to bed – so he’s getting to stay up a little later these days. He seemed to like the bed well enough enough during the day but that night when I put him in it to sleep, he cried and cried and cried and then he would come to find me. We went to bed and he would come out and come to my side of the bed. Finally I just packed up my pillow and laid down on the floor beside his little bed. It took a little bit for his breathing to calm down but he reached his hand down and put it on my shoulder and fell asleep. The next day at nap time, same thing. But I sat down in the rocking chair in his room with a book and read to myself and he was asleep in 5 minutes. I guess he just needed some reassurance. His little crib provided lots of security and this little bed doesn’t give that…yet. We’ve been keeping him up a little later than usual to make sure he’s definitely ready to go to bed when we put him down. But each day is a little easier; he’s getting the hang of it and when he needs it, mama will be there for the security that he needs. I know that the time is truly short. 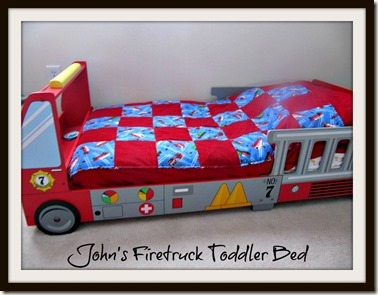 It seems like just the other day that my mom made the little red fire truck quilt for John’s little bed. 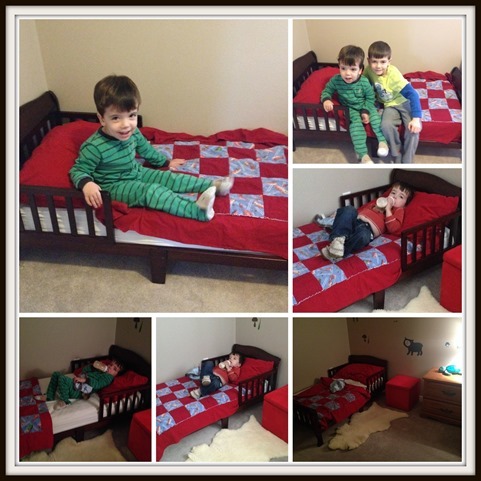 John used it on his bed, long after he moved out of his toddler bed. In fact, he used it right up until we set up Isaac’s toddler bed on January 1st. Then, as I was hoping he would, he raced to his room and got it and gave it to Isaac. Then he turned to me and told me he was too big for it now anyway and that he feet always stuck out when he tried to use it. 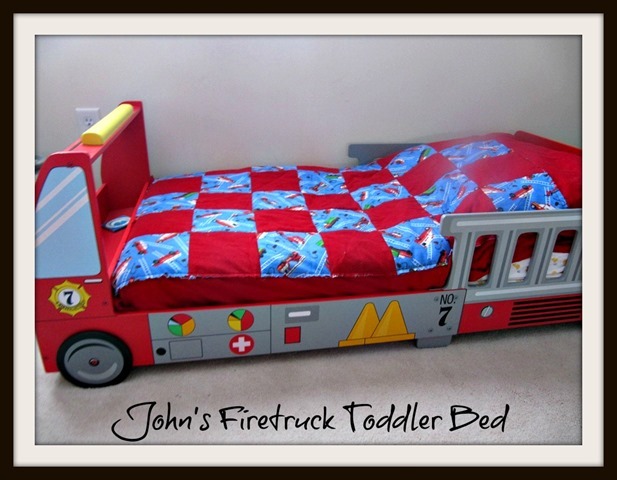 Boys, fire trucks, toddler beds, cute quilts – these are the years! This post is under “Just Life” and has no comments so far.